Double Bay is one of Sydney's snootiest suburbs with it's pleasant tree lined shopping precincts and cafes. Perfect for star spotting on a lazy afternoon. It's often referred to as an Antipodean Rodeo Drive. Just 2 years ago a small local newspaper called Latte Life sprang into life and took on the big guns of the Eastern Suburbs, like the Fairfax Media owned Wentworth Courier one of the world's most advertising sodden publications. 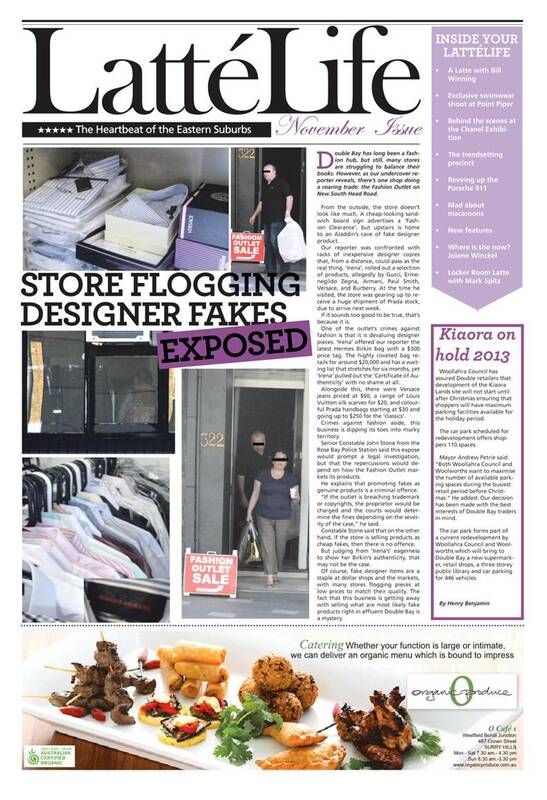 With a small staff Latte Life has uncovered a major scandal right under the noses of some of Australia's major retailers : a 'pop-up' shop that appeared not long ago and which is brazenly selling a range of counterfeit goods. And who was the intrepid investigator who uncovered this major scandal : a 17 year old junior office staffer.